Every weekend I sit down to make the grocery list and list 4-5 meals we plan on having for dinner and then pick a dessert. I love a little sweet treat after dinner and my day doesn't quite feel complete without one! Last week I made an old favorite of ours. I remember the first time I had this. It was my first job out of college at a school and it was parent-teacher conferences so we had to stay late. The PTA generously made us dinner and someone brought mock eclair for dessert. I hounded everyone until I found out what it was because I NEEDED the recipe! Turns out it was pretty darn easy to make and you can easily swap out for low fat/sugar ingredients, too! 1. 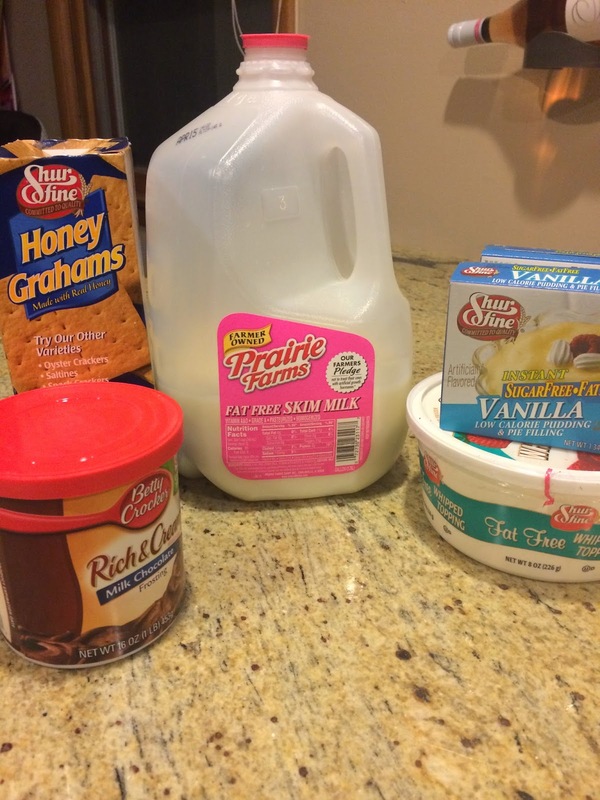 You will need graham crackers, 2 pkgs fat free vanilla pudding, milk, a tub of cool whip, and 1 tub of chocolate frosting. 2. 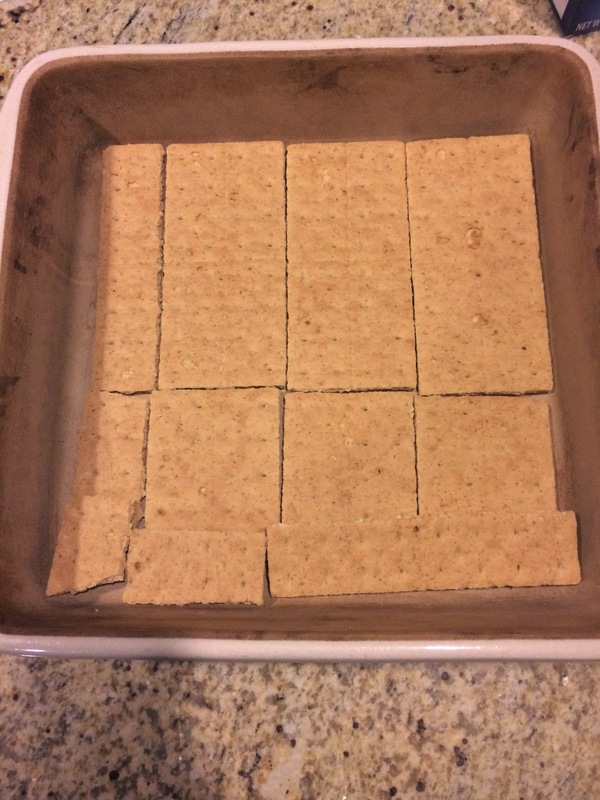 Lay a layer of graham crackers down in a 9x9 inch pan. Break them to fit. 3. Mix up your cool whip, pudding, and 1 1/2c. milk. Spread over graham crackers. 4. Add another layer of graham crackers. Refrigerate for at least 30 minutes so the pudding mixture has a chance to firm up. Otherwise it can be difficult to spread the frosting on top. On a side note, I have read other recipes that have two pudding layers (half of the mixture in each layer) and add an extra layer of graham crackers to separate it, but this way is easier so I stick with it. I also find most pans may not be able to take the extra layer! 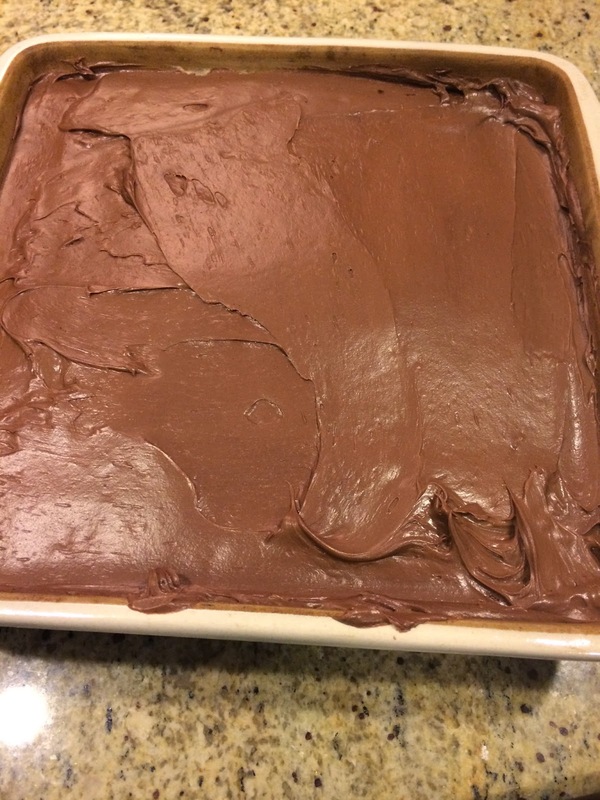 I used my deepest dish this time, but typically the frosting goes right up to the top. 5. Well I guess I gave this step away already. So spread the frosting on top. 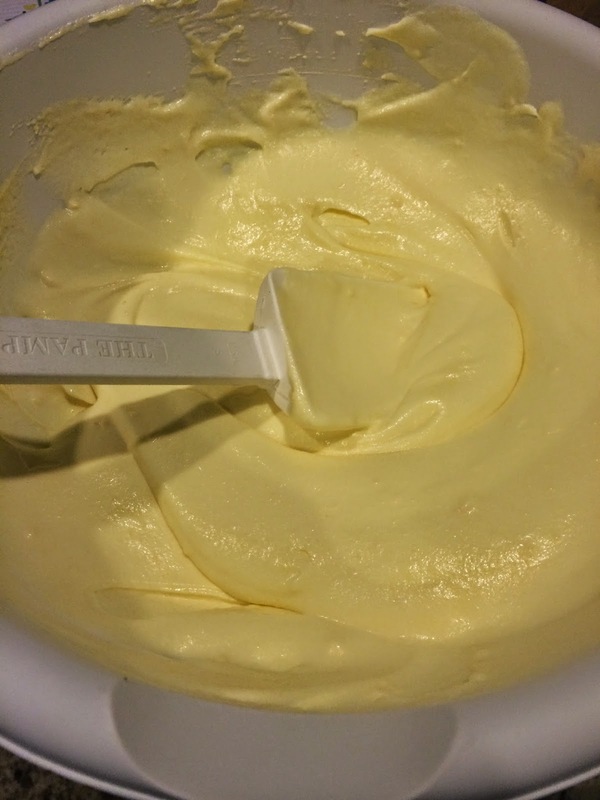 It helps to microwave the frosting for 10-15 seconds prior to spreading to soften it. Just make sure all the foil is off the rim first! I recommend making this a day in advance so the graham crackers can soften. I cut right before serving. 1. 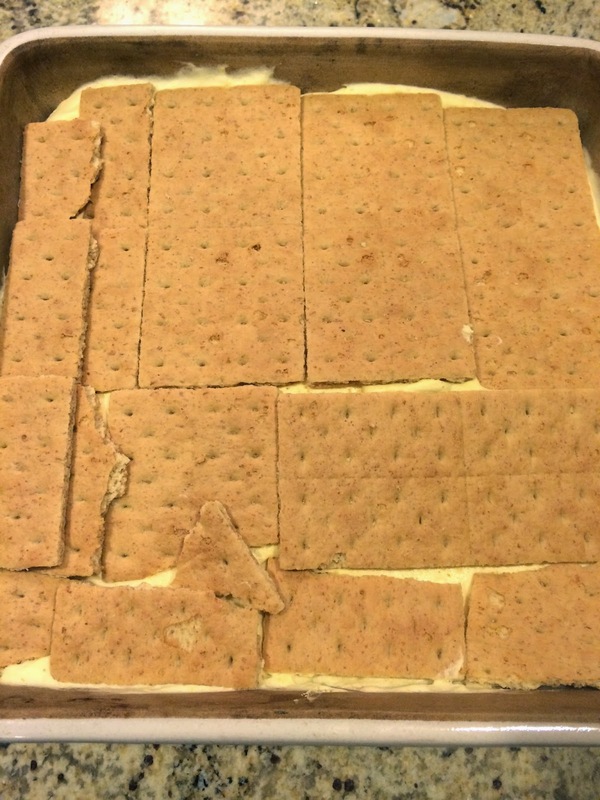 Layer bottom of 9x9 pan with graham crackers, breaking to fit. 2. Mix pudding, milk and cool whip together. Spread over graham crackers. Place another layer of graham crackers over top and refrigerate for at least 30 minutes. 3. Spread frosting over top of graham crackers and refrigerate for 24 hours before serving. Enjoy! 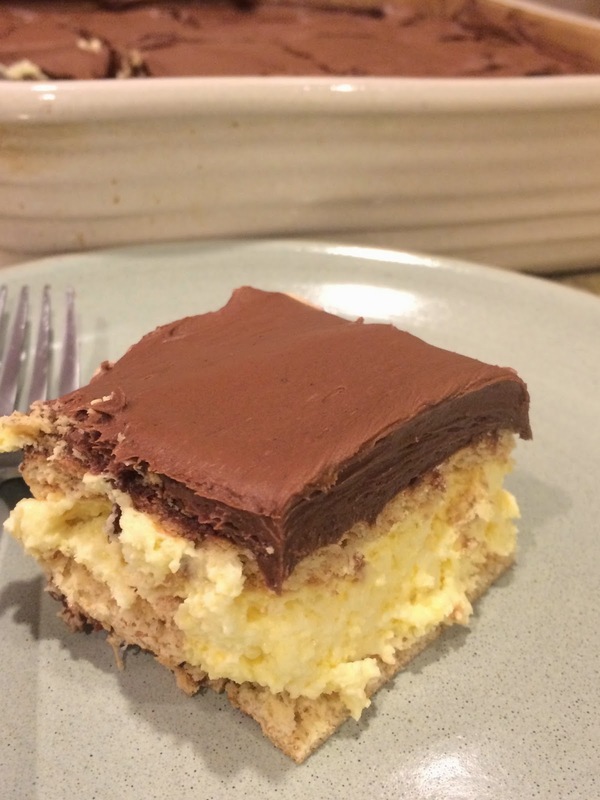 Another no-bake cake I can make. I guess I rhymed lol. Thanks for the recipe and enjoy the weekend! omg that looks delicious! Is it bad that I'm craving it early in the morning? Looks and sounds sooo yummy! I need to make more desserts! I'm so bad, I make about one a week. I wish I could cut down, but I have such a bad sweet tooth! What a great recipe- thanks for posting! 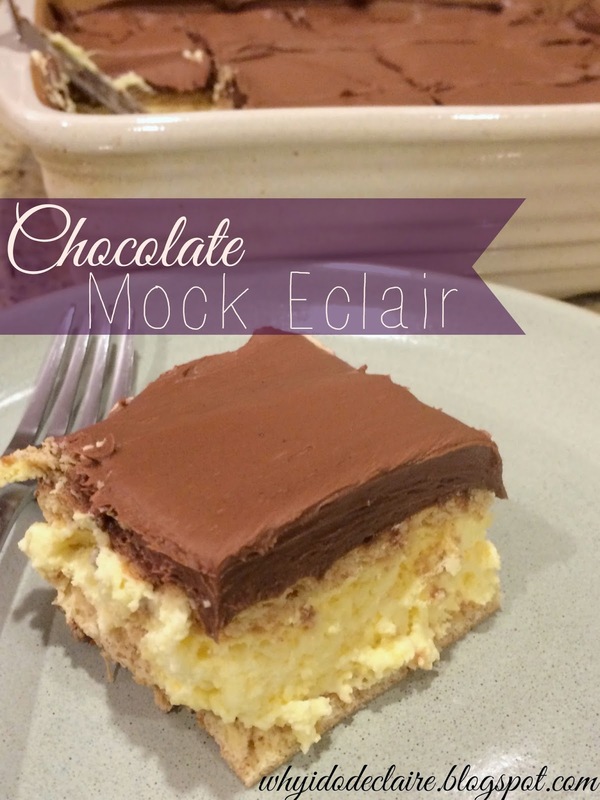 I just made this for dessert tonight (and for the week)-- SO tasty and indulgent! Yours cuts so much nicer than mine though-- but I only used 1 pkg of pudding instead of 2-- maybe that firms it up a bit more? (And I only used half a tub of frosting because I was having a hard time frosting it...but even so, a single slice isn't all that bad for you versus a regular eclair!) YUM! I think the pudding does help making it more firm. And I microwave the frosting for about 10 seconds before using it which helps it spread a lot easier! I'm going to add that tip to the post now! Thanks! Oooh good idea! Maybe I'll do that tonight and spread the remainder of the jar on the slices I have left hehehe! Oh yumm, that looks decadent and delicious, but totally easy enough for a busy day!